This feeder really draws the hummingbirds! 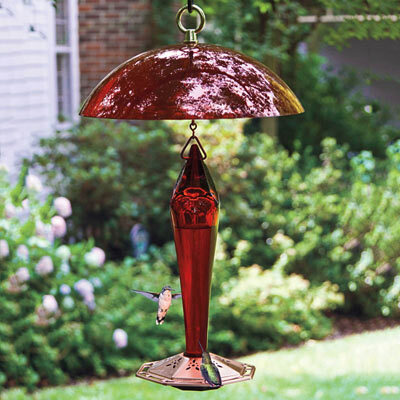 One of our favorite hummingbird feeders, both for the rich ruby color and elegant faceted design of the hand-blown glass nectar bottle, and for its ability to really draw in the hummingbirds! The solid copper base won't deteriorate, and has eight feeding ports and a perch ring to encourage longer stops for your birds. Holds an ideal 8 oz., so most of the nectar will be eaten rather than thrown away when you clean every 3-4 days. Attached 2.5" chain hangs easily. Feeder measures: 11.5"H x 5.5"W. Dome measure: 5"H x 10.5"W.